© 2011 cigarpoet is the owner of the copyright for this website. In total 4 links were found which refer to Cigarpoet.net. The most used keywords in text links are Cigar poet and Cigar. Individual words like Poet and Affirmations are frequently used in text links from other websites. The most important link sources for this website are Acigarsmoker.com and Cigarcraig.com. The homepage of Cigarpoet.net and the subsite are most referenced by other websites. The table shows the most important links to Cigarpoet.net. The table is sorted in descending order by importance. The table shows websites of Cigarpoet.net, which are often linked by other websites and therefore they are classified as important content. two profiles were found for Cigarpoet.net in social networks. Among other social networks the website is represented in GooglePlus and Feedburner. The web server with the IP-address 172.217.22.51 used by Cigarpoet.net is owned by Google and is located in Mountain View, USA. There are many websites run by this web server. The operator uses this server for many hosting clients. In total there are at least 936 websites on this server. The language of these websites is mostly english. 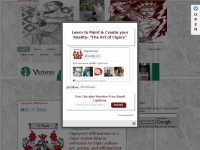 The websites of Cigarpoet.net are served by a Google Web Server server. The HTML pages were created with the latest standard HTML 5. To analyze the visitors on the websites the following analysis software products are used: Google Analytics and Quantcast. The website does not specify details about the inclusion of its content in search engines. For this reason the content will be included by search engines. In order to display ads the Google Adsense advertising network is used. 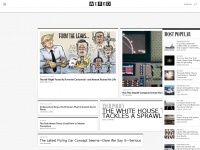 Brainpickings.org - Brain Pi­ckings – An in­ven­tory of the mea­ningful life.